A selection of classic Ladies skirts for older women,all with elasticated waist including pleated skirts. Ideal skirts for the mature and elderly Lady. 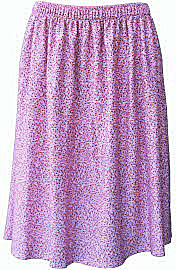 All skirts are machine washable and fully elasticated for comfort. Standard skirt length = 29" (74cm). Short fit (5'2" tall) skirt length = 26" (66cm). 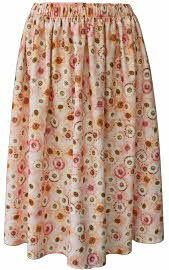 Ladies Pale Pink patterned skirt.